Slow cooker chicken stew is renowned for its combination of apples, red potatoes, onion and seasoning. This warm-cooked stew reminds many of a home-made meal, and the fondest memories of mother’s cooking. It is simple to prepare and is perfect for a cold winter day to bring warmth to your stomach and heart. 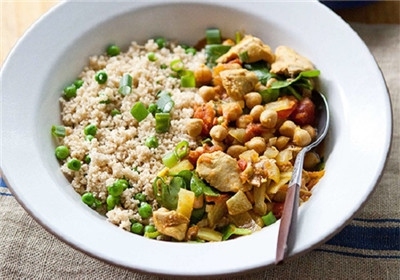 In order to make this chicken stew in slow cooker, you should mix the chicken meet and everything else (except the water, cornstarch, peas and tofu) in a slow cooker and set on High for 4 hours. Combine cornstarch and water in a bowl, whisking until mixed. Add frozen peas and tofu (optional) and the mixture from the previous step to the slow cooker. Stir and cook for an additional 30 minutes at High heat. When it' done, serve and enjoy! 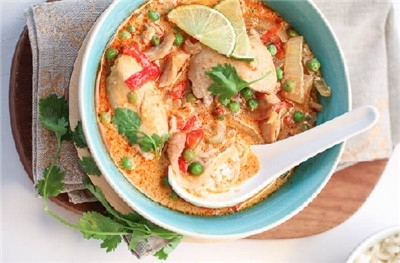 Mix the coconut milk, ginger, curry paste and fish sauce in the chicken stew slow cooker. Add the chicken and onions and then cover up to cook for 2.5 hours on low heat. Transfer the chicken and vegetables to smaller bowls and skim fat from the sauce. Place the sauce in a blender and add the remaining green curry paste, fish sauce and lime juice. Puree until it becomes a smooth mixture. Top it with the cilantro leaves and add rice as a side (optional). Add chicken, onion and garlic to the slow cooker. Then toss in the curry powder, salt, pepper and ginger. Then stir the beans, tomatoes, broth and bay leaf into the concoction. Stir lime juice and spinach into the mixture. Turn down heat and let stand for 2-3 minutes. 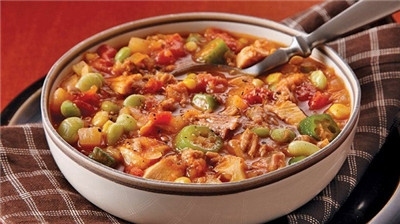 In order to make this version of chicken stew in slow cooker, start by mixing the 6 tbsp. of flour with ½ tsp. of salt and pepper. Coat the chicken in this mixture and place on a separate plate. Heat the oil in a skillet on medium heat. Cook half of the chicken until browned (2-4 mins each side) and add to the slow cooker in an even fashion. Repeat for the remaining chicken pieces. Add bacon and the remaining flour to the skillet. Add stout and scrape. Pour the mixture over the chicken and add carrots, mushrooms, onions, garlic, thyme evenly over the chicken. Add the broth, cover and cook approximately 4 hours on high or 7-8 on slow, until the chicken is almost falling apart. Stir in peas and cook another 5-10 minutes. Then Serve! 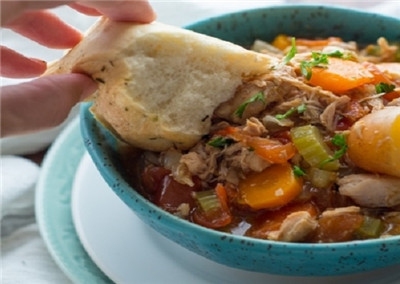 Toss the first 11 ingredients into a chicken stew slow cooker. Cook for 4-6 hours on the lowest possible setting. Blend the corn starch and water, and then add vinegar, rosemary and salt before serving.